After following J. Astra Brinkmann’s work for several years, I began to constantly look forward to her photos popping up on my Flickr contacts stream. She became one of those photographers that you could immediately say “That’s definitely a J. Astra Brinkmann photo” just from seeing the thumbnail. One thing I noticed had started frequenting her work more and more: cats. 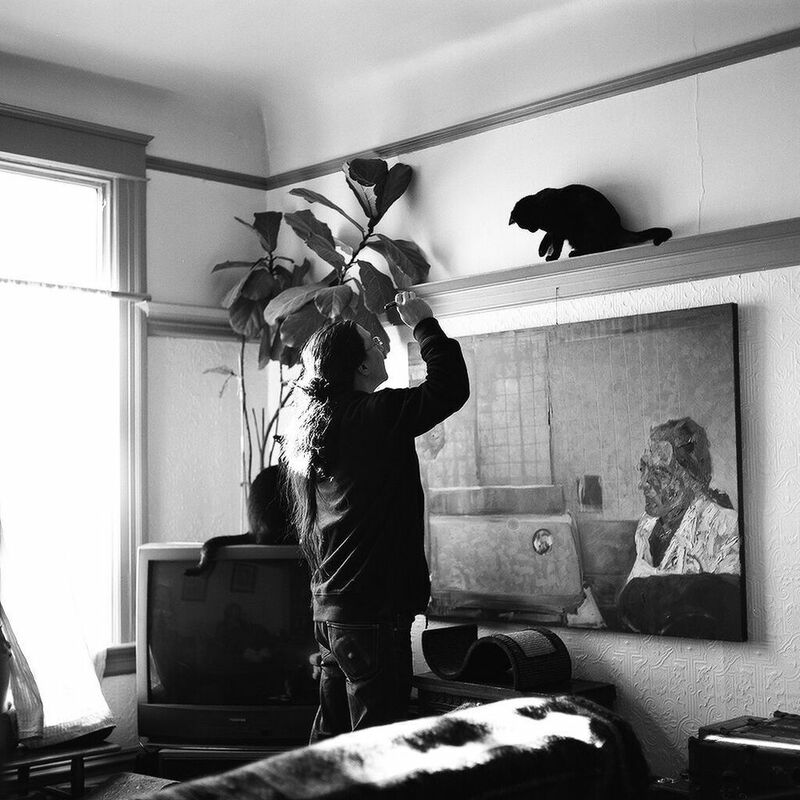 With the internet seemingly hooked on cats like drugs, it’s easy for more feline photos to fall through the cracks, but not Brinkmann’s People with Cats project. Photographing more than two dozen cat owners, she’s created a wonderful anthropological look at the relationship between these animals and their humans. We’re excited to feature J. Astra Brinkmann on Cadillac Ranch Dressing! Where were you born and where do you call home now? I was born in Falls Church, Virginia. I live in San Francisco - specifically the Excelsior neighborhood. How did photography first enter your life? That depends on how you define photography. I used a camera as a kid all the time (you know, disposables! Photos of vacations & sunsets and party snapshots), but I never pursued it until I was older because I was too busy diving headfirst into other artistic avenues. Hilariously enough, I used to think photography wasn't really an art - it was just real life and you pressed a button. But then six years ago, I took a three month long cross-country road trip with my then-boyfriend and was assigned the role of documenting it. His criticisms of these casual snapshots were really harsh ("I can't even tell what the point of this photo is"), so when things between him and I soured, I took up the challenge of trying to improve my skills. But the switch where photography became Photography? Was definitely when I got a Polaroid 600, a Holga and my dad's Canon AE-1 all in the same summer (2009). The discovery of film vs digital transformed the idea of photography from strictly documentary to something pretty magical. Yes, but no degree. I took roughly 2 years of photography classes, as well as 5 years of courses in other majors. My pockets are glad that I stopped going to school, but there are some things I'd love to learn and need to make time for. The hope is that I go to a few workshops and learn how to process color film by hand. Everyone always asks me if I have a darkroom or if I develop my photos myself, and I'd like to some day be able be in total control of how I make my images... but then we're talking about pockets again. "I've never really liked the idea of the word practical - I've always been better and happier with things that allowed me to plan, dream... and dilly-dally." What draws you to use film for the majority of your work? A million things!! I love film so much that a part of me will always cringe when I understand that for some tasks, digital is the most practical answer. But I've never really liked the idea of the word practical - I've always been better and happier with things that allowed me to plan, dream... and dilly-dally. I approach using my camera as if it's a game - the challenge of metering without a meter (which I do a lot, especially at night), for one. The very things that intimidate most people about using a film camera are the things that make me the most excited. The idea that I could totally mess up a shot if I'm not careful (light leak, exposure, timing, etc.) means I have to be very aware of a lot of things simultaneously when I am pressing the button... and I succeed more often than I don't. Even when I make a photograph that I'm not happy with (which could have been avoided by shooting with a different camera), I love it because it teaches me a lesson for the next time I encounter that situation. What influences you to go out and shoot, photographic or not? "I love meeting any nice human beings, I love the game of documenting people, and I especially love meeting cats." How did your series People With Cats come about? There's a difference between the way you view the world when you are holding a camera loaded with color film vs. with black and white film, and I decided a year and a half ago that I needed better black and white work for my portfolio. I wanted a project that would allow me to eventually make my own prints, and I wanted a project with boundaries that wouldn't be too frustrating to pursue. I have three notebooks (not fully completed, as I really like to pick and choose empty pages to write/sketch on) with plenty of ideas that are either embryonic or just unfinished, so the People With Cats series was crafted to make sure an execution and conclusion were achievable. 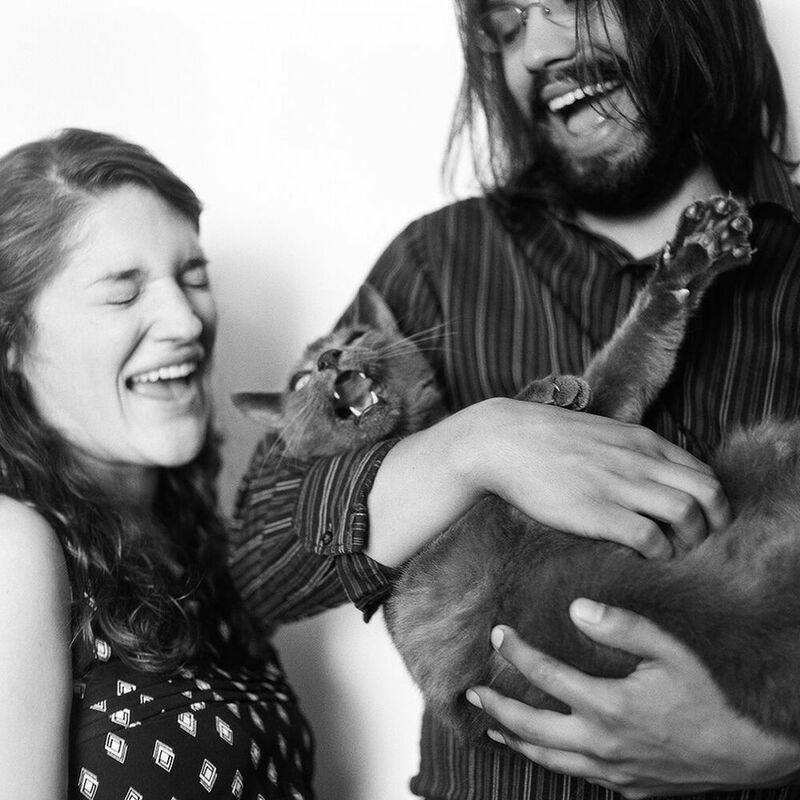 I love meeting any nice human beings, I love the game of documenting people, and I especially love meeting cats. I'm also strolling through another series whose sole idea is having a cat in a window; it's almost as if I feel like stumbling upon a cat in a window is a sign of good luck. Are most of the shoots spontaneous or do you plan them out beforehand? So far, I've photographed 26 people for this project, but there's always some amount of pre-meditation beforehand. Some friends I have decided not to officially include because the lighting in their house would not work with the film type I use (plus a tripod is out of the question for this concept), and more recently, I'm choosing to be picky about the type of the cat and the look of the person that I am photographing because I'm nearly done with this project. Beyond that, I don't give a lot of heavy direction to my subjects because I want it to be as natural as possible; I tell people just to hang out with their cat, and if the cat can handle it, I ask for the owner to hold their cat as close to them as possible. 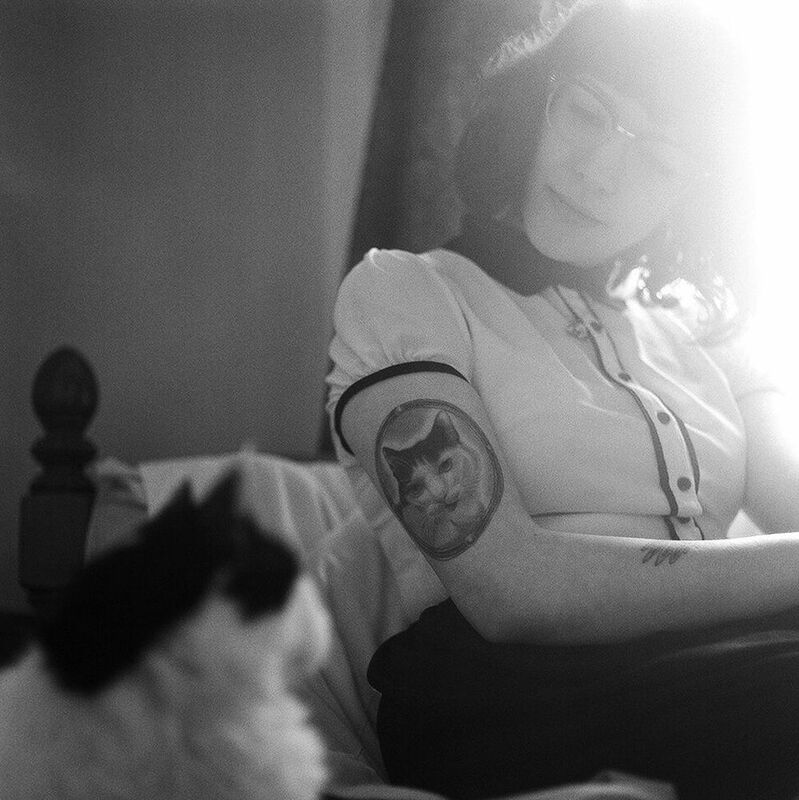 I’d imagine capturing photos of cats with a TLR is pretty difficult. How does a shoot usually go? I make sure that we allot a good two hours for a session, and I don't mind being patient as the cat either warms up or calms down. Only one time have I exceeded 3 rolls on a session, and that's because this one couple was just fantastic. Their apartment is beautiful and comfortable - it feels clean yet very lived-in and alive, and you can tell they take good care of their cats. They were fostering a litter of kittens that came to them via a stray mother who visits their backyard but never comes inside, but they already had three grown adults cats... so trying to get all seven together in a photo didn't happen, but I did try! With the internet’s obsession with cats, what kind of response have you gotten about the series? The internet is a funny place to judge reactions to artwork. You are mostly surrounded by people who are biased in your favor. The negative feedback I've gotten from this series is something I didn't really expect - when people leave weird/nonsensical comments on your photos (they're never intelligent criticism, they're usually just lewd blurbs or spam, I really hate spam), it feels a little like a violation. It's lame when you spend any amount of time pressing "block user," but that's what you get for having your work on a site that gets heavy traffic from strangers who have the ability to communicate with you. But besides those weird little flukes, I have had a lot of nice people say nice things about my photos, and I usually have a nice time with nice cats. As the project keeps growing, where do you see it going from here? Editing. Lots of editing. I want to make some sort of tangible presentation of this project - whether that be a book or an art show with prints or both - which means I have to narrow down my shots. And while I am narrowing down... I'm realizing that there are shots that I am "missing." So far, my subjects aren't as diverse as they could be - roughly similar in age, which is fine, but most of my subjects are white. San Francisco has an exciting array of cultures, and I need to do a better job of capturing that. I've focused so much on getting different types/colors of cats that now I need to curate my humans too, if this is really about many people with cats, as opposed to white people with cats. Are there any other projects you’re working on in the near future? Yes, although nothing that's using as much film as this project. Besides cats in windows, I have another cat related project (of course), but I'm really excited about a photo I'm working on this month. I thought of it three years ago and never shot it - mostly because I am being obsessive with the colors used in creating this scene, as it's nothing you would naturally stumble across.